Notes: The Sierra Bright Dot is a Fore and Aft pattern. The pattern has been used primarily on the Eastside of the Southern Sierra for many years going back to the 1950's. It has remained popular as an attractor pattern yet has not extended it's popularity beyond the Sierra. The Fore and Aft dry pattern goes back to the early 1900's as it's origins have been disputed between the French and the English. Jean-Paul Puguegnot's book , French Fishing Flies, cites a Doctor Juge who created Fore and Aft patterns in 1918. 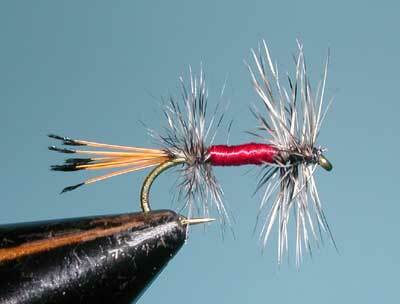 His Taquine pattern consists of a red thread body with grey hackles. Horace Brown of England also laid claim to designing Fore and After flies in the 1930's. Either way, the pattern eventually made it's way to the Sierra Nevada and became a major pattern for the region. Trent Pridemore wrote about the Sierra Bright Dot in his article "Trout Flies Unique to California" (California Fly Fisher July/August 2008). He indicates that the "Bright" of Bright Dot is in honor of Dorothy Bright, the wife of a mine owner at Convict Lake, also known as Monte Diablo Lake at the time. The Brights owned the mining village while it was attacked by 6 escaped prisoners in 1871. This episode led to the name change of the lake. It is unknown who originated the Sierra Bright Dot pattern but it has been a preferred pattern for high elevation lakes and streams of the Sierra, particularly good with Golden Trout.